Mix the chilli powder, garlic powder, cumin and paprika together in a small bowl and set aside. Empty the coleslaw mix into a bowl and stir through the mayonnaise, season with salt and pepper and set aside. Chop the cherry tomatoes, and avocado into small pieces, and place in small bowl with coriander leaves. Squeeze the juice of half lime over the top, stir and set aside. Heat a frying pan over medium heat with a teaspoon of olive oil, add chicken then stir through taco seasoning until the chicken is coated. Cook for a few minutes until the chicken is warmed through. Meanwhile, heat the tortillas in the microwave according to the packet directions. 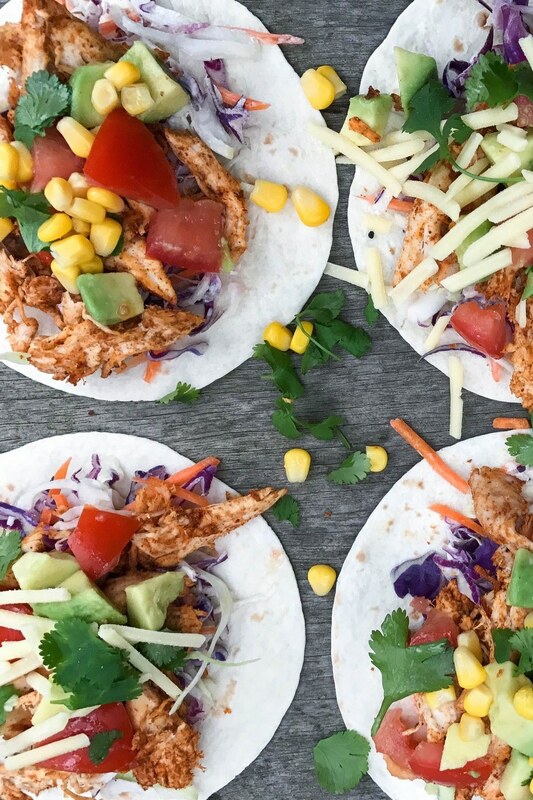 Assemble your tacos, layering coleslaw, chicken, and the avocado and tomato mix and then sprinkle with corn and cheese (if using). Serve with sour cream and lime wedges.